Last week there was much publicity about the discovery of an apparently lost Charlie Chaplin film. Morace Park, of Henham in Essex, purchased a nitrate film from eBay for the princely sum of £3.20 ($5), though he was more interested in the can. When he opened the can he found a reel of nitrate film bearing the title Charlie Chaplin in Zepped. Park could find no record of the film in any Chaplin filmography or biography. The film was a mixture of live action film of Chaplin and animation. 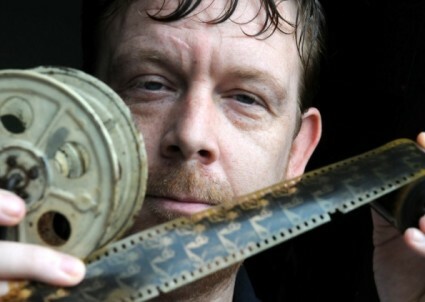 Park’s neighbour just happened to be John Dyer, a former member of the British Board of Film Classification, and together they began investigating the history of the film. 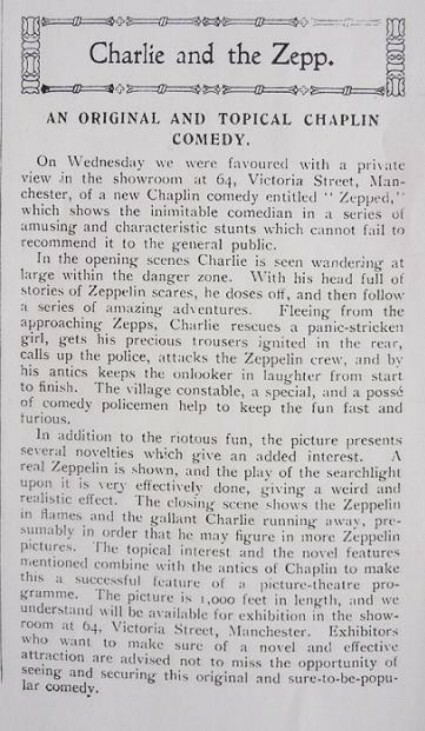 The unearthed film, called Charlie Chaplin in Zepped, features footage of Zeppelins flying over England during the First World War, as well as some very early stop-motion animation, and unknown outtakes of Chaplin films from three Essanay pictures including The Tramp. These have all been cut together into a six-minute movie that Mr Park describes as “in support of the British First World War effort”. It begins with a logo from Keystone studios, which first signed Chaplin, and there follows a certification from the Egyptian censors dating the projection as being in December 1916. There are outtakes, longer shots and new angles from the films The Tramp, His New Profession and A Jitney Elopement. The main, animated sequence of the film starts with Chaplin wishing that he could return to England from America and fight with the boys. He is taken on a flight through clouds before landing on a spire in England. The sequence also features a German sausage, from which pops the Kaiser. During the First World War there was some consternation that the actor did not join the war effort. At first it seemed to those who thought they knew their Chaplin history, and the habits of film collectors, that this was some cobbled-together item by someone who had edited together Chaplin clips with a separate animation film of the 1914-18 period, Chaplin being a regular subject for animators at this time. 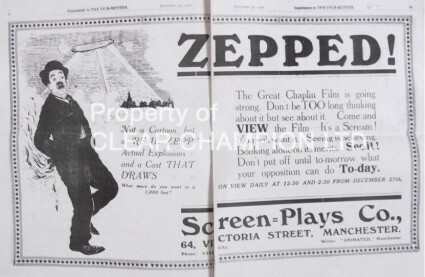 But then evidence turned up that there had indeed been a film called Zepped, exhibited in Britain in 1916. In 2006 British film historian Mike Hammond had uncovered a reference to the film in a Manchester journal (probably Film Renter), as an article in a Russian online journal reveals (scroll down to note 43 and get an English translation through Babelfish). So what is this peculiar hybrid? The six-minute film is a mixture of Keystone and Essanay titles, plus the animation. Chaplin left Keystone in 1914 to join Essanay, leaving the latter to join Mutual in 1916. Essanay is known to have tried to make the best out of its loss by issuing Triple Trouble (1918), a mish-mash of Chaplin outtakes, but Zepped contains Keystone and Essanay titles, suggesting a still more irregular arrangement. The existence of an Egyptian censors’ certificate only adds to the peculiarity of the whole affair. There seems to be a connection with the accusations made at the time that Chaplin was avoiding his military duty by residing in the United States, though clearly this was an unofficial film and Chaplin had nothing to do with its production. Chaplin biographer Simon Louvish speculates (in the Independent article) that the film was compiled in Egypt, which was under British occupation at the time. However, no one was making animated films in Egypt in 1916. 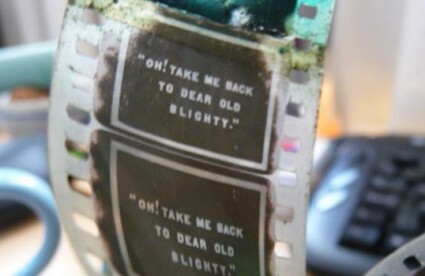 The access to the outtakes suggests an American source, yet the theme and reference to ‘Blighty’ in the title cards hints at a British source. 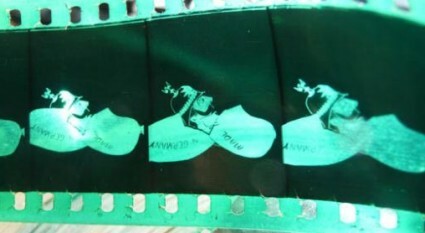 The frames showing some of the animation (below) look like the crude semi-animated films that British artists such as Lancelot Speed or Dudley Buxton were making at this time. The reference to ‘Made in Germany’ is a British allusion (there were protests at the import of German goods into Britain long before the War), and America was scarcely indulging in anti-German propaganda at this time. I’d point the finger at a British film distributor. The film has been transferred to DVD, and Park and Dwyer have been showing it to assorted Chaplin experts. They have also started making a documentary film in America about their voyage of discovery, and you can follow their ‘Lost Film Project’ through Twitter and through a project blog. They seem to be making a good job not only of exploiting the discovery but of seeking to understand it. If it’s not quite ‘THE cinematic find of the last 100 years’ that the blog claims, it’s a real coup – not least for how it has left the experts baffled. We now await anxiously for the results of their researches. You can see the documents on the website for the company producing the documentary about Zepped, Clear Champion Ltd. The latest extraordinary twist in the Zepped saga is that another print of the film has turned up, this time in a second-hand shop in South Shields, UK. This second Zepped is slightly incomplete (opening shots of a Zeppelin are missing, apparently) but otherwise looks to be the same film. It was discovered by one Brian Hann. More information (though with a muddled idea of the film’s history and value) is given in The Shields Gazette and in the comments below. Luke: Thanks for sharing the information and images. For some reason, “Zepped” strikes me as a modern-sounding title. Perhaps it’s memories of “The Song Remains the Same.” I never saw the movie but the Parkside in San Francisco seemed to show the trailer every time I went for a year. The connection between Charlie Chaplin and Led Zeppelin remains a largely unexplored one, I believe. ‘Zepped’ doesn’t seem to have been a common slang term in 1916 – the word searches I’ve done in newspaper archives come up with zep or zeppelin, but I haven’t found a zepped as yet. When I was looking via wordsearching in the Guardian archive for any references to the title, the word “Zepped” – in quotation marks – came up in an interview from 1917; IIRC a dockworker describing an air-raid. That would suggest an authentic London slang usage. Chaplin experts, particularly in the UK are of course keen to see the film to help identify it but Mr Park has has not as yet shown it any of them – Why so coy Mr Park? I also think the animation is Buxton or Hicks. There is apparently some live Zeppelin footage which could be very likely identified. I also agree that Buxton is possibility for animation, also I noticed that Anson Dyer was not averse to using Chaplin in his work. I would love to see anything by him. My hunch is that the animation is a sequence from John Bull’s Animated Sketchbook, the series on which Dudley Buxton and Anson Dyer worked. One of the surviving examples (no. 15) even has a cartoon Chaplin tackling a Zeppelin (see http://www.oucs.ox.ac.uk/ww1lit/collections/item/5508?CISOBOX=1&REC=3). That would point the finger at Ruffell’s Imperial Bioscope, the film renters behind the Sketchbook, with someone there opportunistically cobbling together Chaplin footage (from one or more films, it’s unclear from the reports), intercutting it with the animated sequence, and putting out in a Manchester cinema or two as a new Chaplin film. How it then gets to Egypt, goodness knows. I’m no Chaplin expert, but they might also look into Langford Reed’s ‘Chase Me Charlie’ and Chaplin’s Liberty Loan film. There were a lot of Chaplin compilations from the time (and later). See Okuda/Maska’s book re Chaplin at Keystone and Essanay and Niebaur’s re Chaplin at Essanay. Wouldn’t the Liberty Bond film be a couple of years later than “Zepped”s appearance?? I was interested by the John Bull’s Sketchbook mentioned by Mr Urbanora….its drawing style, when it gets to Charlie, does resemble the unknown Chaplin animations screened in Pordenone by the Jugoslavian Film Archive. Yes, you’re right about Liberty Bond – my mistake. But would Langford Reed be worth checking on by you Chaplin experts out there? I guess one important point from all this is that Chaplin was so popular that there were all kinds of attempts to exploit the marketability of his image, in this Egypt-shown ‘compilation’ as well as in other cases. A similar phenomenon is that of revivals: popular films being re-released well after their original screenings. This goes way back: Griffith’s films were re-released, for example, sometimes years after being seen originally. 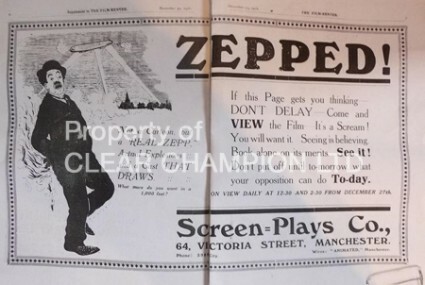 An advertisement and press notice for Zepped from the Manchester journal Film Renter have been published on the site of Clear Champion, the company producing the documentary on the find.The journal is dated 30 December 1916. The advertisement is intriguing because it shows Chaplin yet does not mention his name. A week later, however, in the same journal, the advert was repeated and this time mentioned Chaplin’s name. It also says that the film was produced by Screen Plays Co. of 64 Victoria Street, Manchester, a name that’s new to me. The ‘review’ is standard press elease puffery, though intriguing in that it makes no mention of animation. I’ve now played my little bit in the Zepped story by being interviewed (more of an informal chat, really) for the documentary Park and Dyer are making. Filming took place at the Cinema Museum, sitting in their cinema looking at fleeting clips from the film on a tiny DVD player, which was a bit rum. A couple of interesting features that haven’t been highlighted so far. One is that there is supposedly film of a Zeppelin in flight over an English town, though given that it is filmed in daylight it is more likely to be a British airship (the Zeppelins only attacked at night). 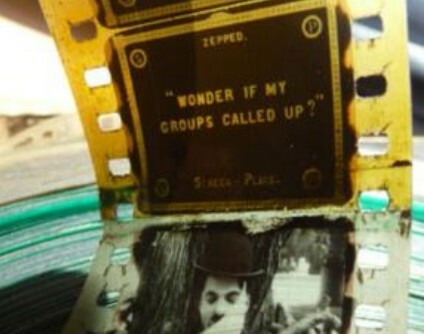 The other is that footage of Chaplin is ‘treated’ by having an explosion occur behind him – either white streaks on the film or scratches have been added. It’s a very odd film, of inpenetrable provenance. I told them that seeing the little that I saw of it made me feel that I knew just that little bit less about film history than I did before. Morace Park leads the singing. Could this also be a clever hoax? Designed to show experts as being not so expert. The idea being that an expert in a field can be fooled from many different angles? Interesting theory, but it is a genuine film which was produced in 1916 (there are descriptions in the film trade press to prove it). Just why it was made is unclear (did the film company start with animation and then add Chaplin film, or the other way around? ), but it is genuine nitrate footage, genuine Chaplin footage, and the animation is certainly in 1916-style. A hoax would never be so clever, or so odd. None of which precludes experts from being fooled sometimes – just not this time. Anyone intrigued by the film, following all of the publicity it has received over the past few days should please note that the press reporting has been embarrasingly ignorant and uncritical of the press release material fed to it. This is not a major film discovery, it is not a lost Chaplin film, it was not produced as a morale-boosting film for the British troops, it is not a ‘watershed’ moment in film history, it is not worth £100,000 (or it’s a prize fool who would pay such a sum). Zepped is an obscure British animation film from 1916, typical in its rudimentary technique to other animation films of the period, and unusual only insofar as it includes unauthorised clips from Chaplin films. Animation films with Chaplin figures were not uncommon at this period. Using clips from Chaplin films alongside animation and claiming (obliquely) that the film was a Chaplin release is not common, however, and that is what the makes the film of some minor interest to film history, but it is very minor interest. Mr Park, the film’s owner, has had a whale of a time promoting his discovery, so good luck to him. But the BBC, Daily Mail, Times and numerous websites are guilty of peddling the most ignorant twaddle. Update: It now seems very likely that Mr Hann has not found a second copy of Zepped (which did seem highly unlikely) but rather a copy of Chaplin’s His New Profession, parts of which feature in Zepped. I am writing a huge thesis paper for school and I was wondering if you know where I can find/purchase digital scans of Charlie Chaplin’s original “Modern Times” script. If that is not available, do you know where I can find scans of miscellaneous notes Charlie Chaplin made relating to the production of “Modern Times”? Unfortunately, I have to have original primary sources for support of muy research topic. Any contacts you have or information would be more than greatly appreciated.